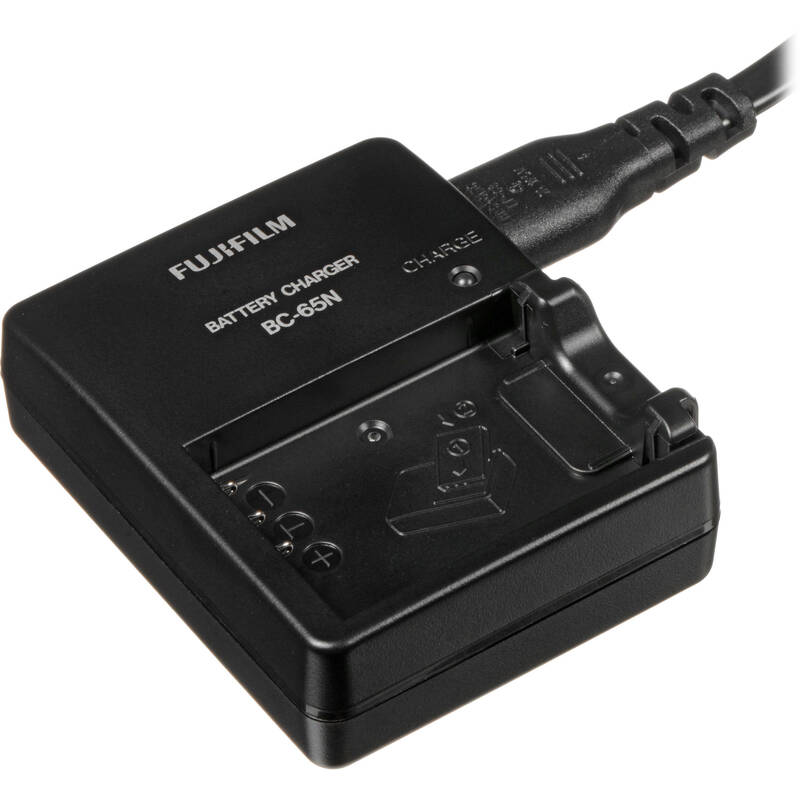 This is the BC-65N Charger for the NP-95 Battery from FUJIFILM. It's bi-voltage and can be used internationally with the proper plug adapter. It comes with a base unit and power cord. Box Dimensions (LxWxH) 7.9 x 4.4 x 2.3"
BC-65N Charger for the NP-95 Battery (100-240V, 50-60Hz) is rated 4.7 out of 5 by 10. Rated 5 out of 5 by George from Works well I only wish that they weren't so expensive. They work well. Rated 5 out of 5 by Eb from Charging options are important! I purchased an extra battery; I can charge one in the camera and the other in this at the same time. I love having a dedicated wall charger if I'm in a location where I want to keep the camera secure. The battery sits in the charger, so if you have the charger at extreme angles, or knock it, the batter may come out. Rated 5 out of 5 by Geekosaur from Alternative to in Camera Charging I'm not fond of the idea of in camera battery charging. I also like the option of charging a battery while I am using the camera. This charger solves both problems while assuring 100% compatibility with OEM batteries. Rated 5 out of 5 by Frenchy from Faster than USB This is a MUST if you have more than one battery. We travel a great deal and go through a battery a day, so USB charging alone would not be practical. Works fine - should have been included with the camera. Rated 5 out of 5 by Lynn from Charger works I had an after market charger that worked at first but then never fully charged the NP-95 batteries. The Fuji charger works and solved the problem of batteries going down to quickly. Rated 5 out of 5 by Robert from Extremely happy with purchse! Works great! Enjoyed having second source for charging batteries for my FUJIFILM X70 while on vacation. Having second charger enabled me to charge two batteries over night. Rated 5 out of 5 by Anonymous from Works great At first I thought that a charger that plugged directly into the wall would be handier but I now prefer this model with a cord. Surprised by the reviews here. This charger is defective. It shows a green light but doen's charge. Seems that many people have this issue (check online) but nobody mentions it here! Anyone else having trouble and if so, can it be fixed? Apparently no B&amp;H reviewers have have had a negative experience with this charger. We recommend if you do have an issue, to please contact the B&amp;H Customer Service in the first 30 days of ownership for an exchange or after that, please contact Fuji for service. One year for camera but only 90 days for charger. According to warranty info from Fuji (ii) ninety (90) days regarding lithium battery, AC adapter and battery charger. Mine died after 8 months. does it work with the NP-W126S Battery? Sorry...no...mistake. For the W126 and W126S you have to use the BC126 charger. My apologies. Do you sell the small insert that presses the battery to the connectors? Mine is lost. Which insert do you want? There are two different pieces, one small and one big. I use the small one, thats fits the NP-95 battery. I can sell you the bigger one, that I THINK fits the NP-40. Will the Stub Plug Adapter, which you sell, fit this product? Yes the Stub Plug Adapter will work with this Charger.